GALION — The Evergreen Company, 117 Harding Way East, is celebrating their 25th anniversary with an open house through Sunday, Nov. 5. 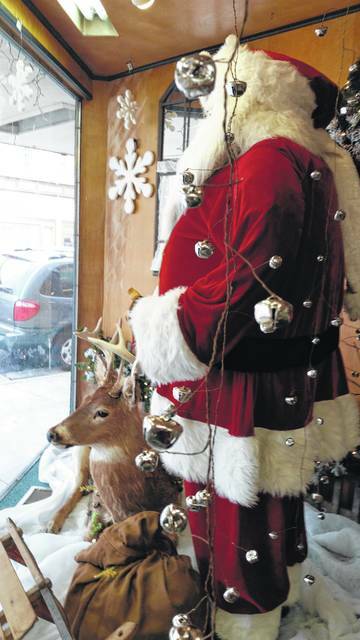 During the open house, all Christmas décor will be 25 percent off regular prices. The celebration will include spinning the popular “Wheel of Good Fortune” plus refreshments and door prizes. Susan Gimbel, owner, has a life-long love of the Christmas season so it was no surprise to her family that she started The Evergreen Co. as a year round Christmas shop. As a young girl, any birthday money she received was spent on buying Christmas ornaments. Of course, a large variety of ornaments have always been, and still are, a major part of The Evergreen’s many offerings. Over the years, everyday gifts were added, as well as ladies boutique. Susan has always included antique furniture (for sale) as part of her displays. In fact a ‘back bar’ rescued from a local building has been restored and now houses the inventory of Willowtree figurines. Susan cites the Mallard Bay Trading Co of Cleveland as inspiration for the initial vision of her Christmas shop. Even though the shop continued to evolve over the years, Susan’s product mix has remained a unique blend of old and new. When asked how she came to name the store, her reasons were threefold. “Obviously the evergreen is considered a Christmas tree. Also evergreen conjures up the essence of nature with its sights and smells”, she responded. “Thirdly, evergreen also infers ‘lasting’.” That was her hope for the store. “Being in business 25 years may just mean that the name Evergreen was indeed a good choice”, Gimbel stated. The Evergreen Co is on facebook and found at www.myevergreencompany.com Phone: 419-468-4472.